As discussed back in September (see post), the ECB may be forced to take further action in an attempt to reignite the area's recovery. 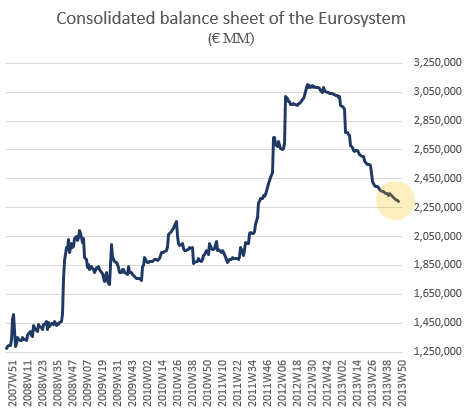 The central bank's consolidated balance sheet is continuing to decline and many are blaming this reduced liquidity for the area's weak credit growth as well as tepid and uneven economic expansion. It was therefore not too surprising to hear that the ECB is in fact discussing taking further non-conventional policy measures. Reuters: - The European Central Bank is considering a new long-term liquidity operation available only to banks that agree to use the funding to lend to businesses, a German newspaper reported on Wednesday, citing sources. A few months ago some economists were hoping that the relentless decline in credit growth in the Eurozone may have bottomed. The year-over-year changes in the area's loan balances have turned in the right direction. Unfortunately the latest data show that not to be the case - both in corporate and consumer lending. This lack of credit expansion is a dangerous trend that could result in years of Japan-style stagnation. In order to address it, one approach the ECB is contemplating is forcing the banking system to use the new LTRO proceeds to provide capital into the consumer or corporate sector. Reuters: - The ECB extended more than one trillion euros ($1.36 trillion) of cheap three-year loans to banks through two long-term refinancing operations in late 2011 and early 2012. The news came after ECB policymakers said last week they were open to taking fresh measures to support the euro zone economy, where inflation is running well below target [see discussion]. It's difficult to know if this program will work. Banks are under pressure to shrink risk weighted assets to comply with the new Basel accord. And retail and corporate (particularly unrated smaller firms) loans tend to attract significant amounts of regulatory capital (risk weight) charges. It's much easier for a Eurozone periphery bank to buy its government's bonds - with almost no regulatory capital impact - than to lend to small firms and households. Therefore many banks may forgo the new LTRO that has such strings attached. Nevertheless it seems that the ECB may be willing to try.